Vacation At The "Human Zoo," See The "Long-Neck Women!" 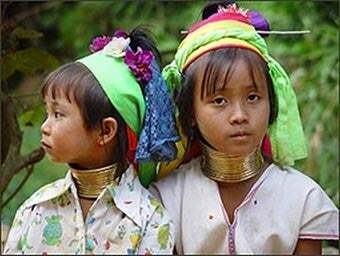 When National Geographic first ran images of the Padaung, it was anthropological gawking - but the "exotic women" whose collarbones had been depressed from early childhood with heavy brass rings, had at least been photographed on their own turf. Now, as refugees from devastated, war-torn Burma, they're a popular tourist attraction in neighboring Thailand - brought in by entrepreneurs who keep them in an artificial village they're not allowed to leave. And, as the Washington Post's Amit R. Paley found, it's a sad and complex situation. While many consider this a human rights violation so heinous that more scrupulous travel companies refuse to sponsor tours to their village, others are more pragmatic: for the refugees, some defenders - and, indeed, villagers themselves- claim, it's better than the dangers of Burma, and gives them a chance to make money by selling handicrafts to tourists or charging for photographs. Said the Seattle PI's Denis Gray when he visited their compound a decade ago, "Economically it's a virtually perfect arrangement. Everyone gets a cut — the once impoverished Padaung, Thai businessmen and government tax collectors, even a rebel group that uses the money to finance its war with the military regime in Burma." Morally, it's far from perfect. Whatever the villagers' feelings about the situation, they're clearly being exploited. Thailand, which has given them asylum, is profiting. And the Tales of Asia blog points out that the practice is actually in violation of UN High Commission for Refugees guidelines, which prohibits putting refugees "on display." While no one whom the Post's Paley spoke to claimed to be ill-treated, the facts are still shocking. "Why do we wear the rings?" said Mamombee, 52, whose neck seemed particularly elongated. "We do it to put on a show for the foreigners and tourists!" I couldn't tell if she was joking...There were no guards around, and it did not look to me as if anyone would physically stop the women from leaving. When I asked how they had arrived at this village, they said a man named U Dee, whom they referred to as "the middleman," first began bringing Padaung to the spot about three years ago. There are now about 50 families there, including some from a tribe known as "the long ears" because they stretch their lower earlobes by wearing enormous rings.Some families said they were paid about $45 a month, while others were given a sack of rice. One orphan girl said she was not paid at all. All the women and girls tried to raise extra money by selling trinkets or charging money to be photographed. The women are not allowed to leave the one-acre village. Groceries and other supplies are brought in by motorcycle every day. "We have to stay with the middleman," Mamombee said. "If I leave, he might call immigration." Tourism has, at least for the time being, preserved a custom that had begun to disappear as the Padaung came into contact with the outside world.Traditionally, only Padaung girls born on a Wednesday of a full moon were destined to have their necks fitted with the coils, but now other youngsters are enlisted to meet the tourist demand...Only initial discomfort is reported after the coils are set and as the distance from ear lobe to collar bone lengthens to as much as 10 inches, more than double the average. The only danger posed is if the coils are removed. Suffocation could result since the neck muscles are so weak they cannot support the head. It may be true that as refugees the Padaung would have limited options. Perhaps, given the choice, many of them would still opt to work the tourist trade; we can't know. But choice is the operative word: without that, it's a poor sort of asylum. And any tourists who thinks they're observing tradition should know they're seeing something far more modern - but at the same time, just as sadly old as commerce and exploitation.